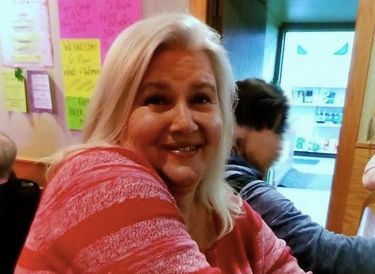 Lois Riess, of Blooming Prairie, Minnesota, is the target of a multistate and federal search now that her husband was found dead at their worm farm and a Florida woman was killed; that woman's car was later discovered in Texas. With her platinum blonde hair and a cherubic smile, Lois Riess looks in photos like what she is — a 56-year-old grandmother from small-town America. 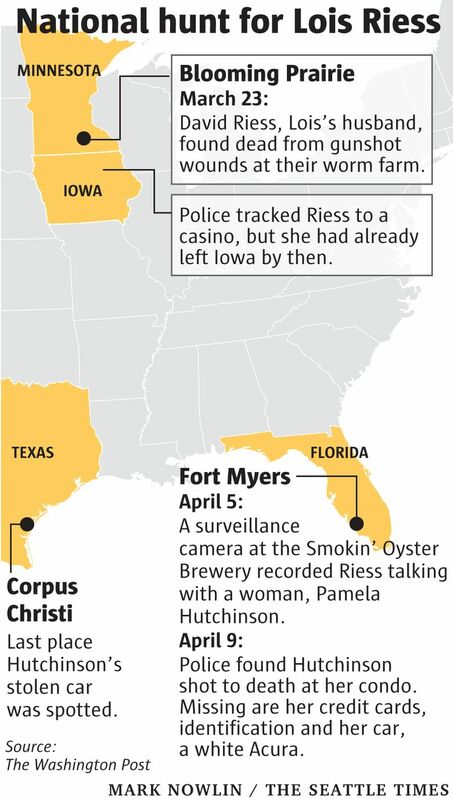 For the past three weeks, police say, Riess has led them on a nationwide pursuit — from the Minnesota worm farm where they found her husband shot to death last month; to Florida, where they suspect Riess befriended and killed a woman who looks like her to steal her identity; and finally to Texas, where police fear she may find her next target. Riess and her husband, David, were well known and well liked by the 2,000 or so other residents of Blooming Prairie, Minnesota, according to the Minneapolis Star Tribune. They were both regulars for lunch at the local Servicemen’s Club, nearly 100 miles south of Minneapolis. David owned and operated a farm for fishing bait — Prairie Wax Worms. NBC News reported Riess had a gambling addiction. On April 9, police found Hutchinson shot to death at her condo in the same city. Another surveillance camera photographed Riess at the building. Hutchinson’s uncle told WTVR she’d been shot through the heart. The search for Lois Riess was now a multistate and federal matter. More public advisories went out, with more photos of the grandmotherly woman and the car she was believed to be traveling in, which was now the car of the woman police think she killed. In Florida, the deputy sheriff told NBC he had never seen a killing like it. “This is the first time in my career I’ve seen someone steal someone”s identity and target them for the way they look in order to murder them,” Marceno said.